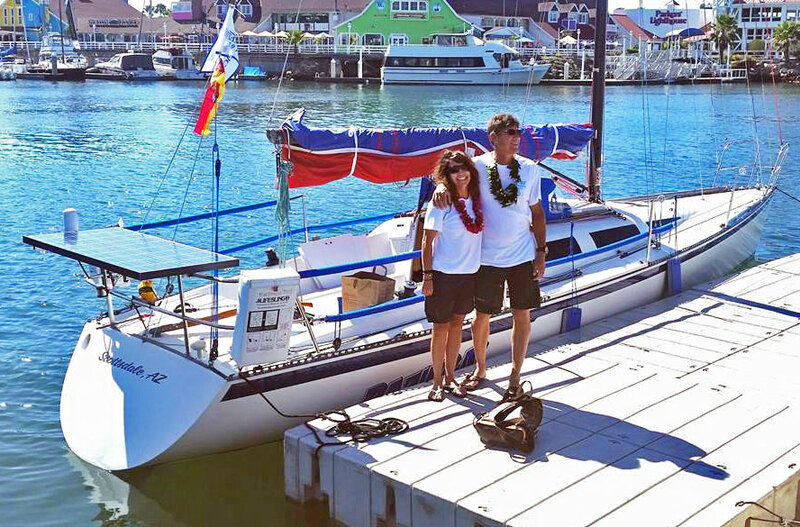 Preparing our Hobie 33 Bazinga for the 2015 Transpac was a two-year challenge, but with the help of the experts in San Diego it was a wonderful experience. We painstakingly went through every nut and bolt on Bazinga, leaving nothing to chance. One of the major focuses of the refit was the rudder. Anybody familiar with the Transpac knows that the number one reason for boats not to finish is rudder failure. The boat was inspected by the original Hobie builder out of Dana Point and nobody knows Hobies better than Spartan Marine. The rudder skin was removed down to the stainless shaft, exposing the three stainless cross members and their welds. The welds were massive and looked new. The rudder was then re-skinned and brought back to original. A sleeve was added to the upper aluminum rudder tube, increasing its strength. Rudder tube bushings and Delrin washers were replaced. This work was completed 1½ years before Transpac and had been tested in a dozen races without incident. We dropped the rudder in April to have another look and all appeared good. We hired weather routing expert Rick Shema, “The Weather Guy,” to plot our route from Point Fermin to the finish at Diamond Head in Oahu and his plan was flawless. He predicted our arrival in 12 days and 7 hours. We were ready. On the fifth day at sea and 700 miles from the start, around 5 pm, the watch crew was alarmed to find the tiller and rudder pointing in different directions. They couldn’t steer. The wind was blowing 18 knots and we were in 15-foot seas. We were still trying to figure out what was wrong when we saw the rudder came out from under the boat and float away. Now the real work began. No rudder, heavy seas, and only a few hours of daylight remaining. Mod 1: We attempted to fabricate a rudder with an aluminum spin pole and a too-large blade made from a fiberglass bunk. The pole failed with the first wave over the stern and folded in half. What works well in 10 knots of wind definitely does not work well in 20+ knots and large seas. We decided to throw the sea drogue over the side and comfortably beam-reach through the night. All was good until we sailed into a high pressure system and slowed dramatically. The drogue brought us to a stop. Mod 2: Reaching strut with the back-up tiller handle and a hatch board from the V-berth held together with gorilla tape, clamp, nuts and bolts and attached with Dyneema line to the stern rail at the high point and the toe rail at the lower point. We cut plastic water jugs into strips for sleeves. That got us through the high. There was nothing more realistic to do than to sail at a little over one knot, covering 10 miles in 10 long hours. We were still 625 miles from Point Fermin. Eventually the next day the wind picked up and we were back to 5-6 kts. At this speed, the reaching strut couldn’t handle the pressure, nor could we. The tiller was in line with the blade and we had no leverage. Mod 3: We cut the broken spin pole in half, set the handle at 45 degrees and re-attached the hatch board with gorilla tape, clamp, nuts and bolts and attached to stern rail and toe rail. We called Rick Shema on the sat phone to get the latest weather information and he suggested we heave-to for two days, allowing tropical disturbance Dolores to pass. We headed north and as the wind increased the pulpit started to bend and welds began to fail. We continued to lash the pulpit together. The Bill Lee Mod 4: Slide the carbon spin pole off the stern with two spin sheets run through the spin blocks. Attach the pole to the stern and run the spin sheets to the tiller. The arrangement worked, but it didn’t take long for us to be worn out. We could only do 30-minute watches. Five hundred miles to go. Mod 5: Wrap spin sheets around winches and grind to head up or fall off; very labor intensive. Mod 6: Combination of sea drogue and spin pole rudder system proved to be the best balance in the varying wind and sea conditions. Three hundred miles to go. Coast Guard San Diego hails Bazinga on the radio wanting to know our status. We plan to sail as far as possible and then motor until we can get to within 40 miles in order for Vessel Assist to tow us in. Copy. Let them know when we’re 100 miles out and when we start to motor. One hundred miles out we start the motor. At 40 miles out we hail Vessel Assist. Whoa, not so fast. They inform us they won’t come out until we’re out of gas. So we keep motoring through the morning hours. We drain gas from the generator to get us to SD Bay. Mark Butler and Steve Harrison meet us and tow us to SDYC. We hail Coast Guard SD and thank them for keeping an eye on us. Vessel Assist hails us and wants to tow us back to SDYC. We thank them for all they did for us, but we’re under tow by friends. Back on dry land, we could investigate the rudder failure. When the boat came out of the water we saw four inches of stainless steel rudder shaft protruding from the bottom of the boat where the rudder used to be. The shaft had sheared at the top of the blade, most likely from corrosion from the inside out. With no pitting or corrosion on the outside of the tube, it would be next to impossible to foresee an internal failure. The Campos in happier times, as they prepared to leave for the trip.